San Francisco, CA (April 23, 2018) – Puzzled over what games to offer tech savvy kids in 2018? Look to the toy industry’s single player puzzle leader, SmartGames. Despite an overwhelming choice of Apps, video and online options, nothing beats a quiet period of total concentration as a child makes his next move. 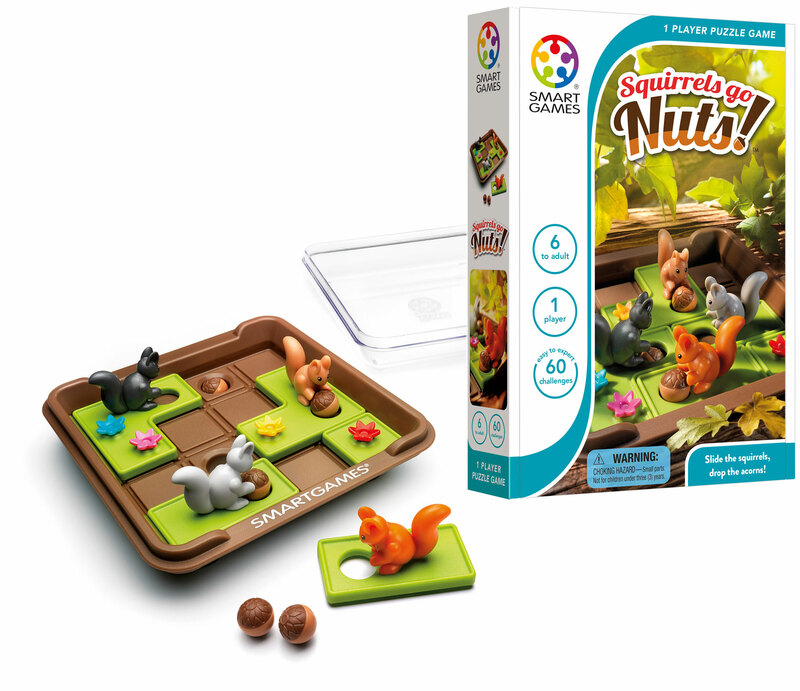 With a challenging puzzle built for solo play, especially with an irresistible name like Squirrels Go Nuts™ ($14.99), kids – and adults – discover their ah-ha moment. Parents and grandparents who grew up on Chess or Chinese Checkers can appreciate the value of SmartGames cordless adventures where one move leads (or maybe not) to another. Games requiring logic — even for those as young as 6 years old — serves up a bounty of benefits. SmartGames rolls out a new line of travel puzzles and boxed games that improves memory, boosts logical thinking, enhances concentration, and best of all, creates self-confidence. With appealing names like Asteroid Escape™ ($14.99) and Squirrels Go Nuts, elementary, middle and high schoolers will happily put down the smartphone and click off the social media for some me-time. Cognitive skills from planning and memory to problem solving and spatial insight will get a jolt while climbing a ladder to mine for gold or navigating a spaceship through an asteroid field. 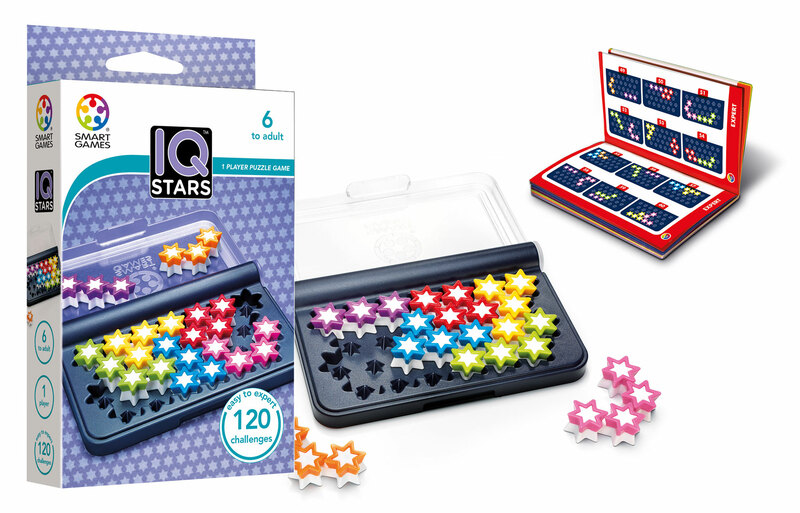 SmartGames’ third offering, IQ Stars ($9.99) is the ideal introduction to SmartGames’ IQ series for younger players, though simple task of placing stars on a grid is not as easy as it looks. Let the fun begin! SmartGames, part of Smart Toys and Games (which also manufactures bestselling brands GeoSmart and SmartMax), is coming off a banner year of sales and promotions. Their reputation for products, adored by retailers and parents, have earned them a spot as a 2018 TOTY Finalist and an armful of accolades including a 2017 ASTRA Best Toys Winner. Can you help the Squirrels get ready for winter? Can you move the squirrels around and hide their nuts underground? Squirrels Go Nuts is a sliding puzzle with 60 nutty challenges to test your skills. This endearing 3D game board, with bushy-tailed squirrels and autumn leaves and acorns, includes a snap-on lid to easily store everything. Also included is an illustrated booklet of 60 challenges (and solutions). Here are three questions to ponder: can you fit all the stars in the grid? Are your brain skills out of this world? Can you place the 7 stellar puzzle pieces on the grid? Reach for the stars and solve the 120 challenges, from easy to expert. To play in three steps, choose a challenge then place the star puzzle pieces as shown on the grid. Next, fit all the remaining stars on the grid. And finally, there is only one solution. Navigate your spaceship through the asteroids. As pilot, your flying skills will be tested to the limit in order to escape! 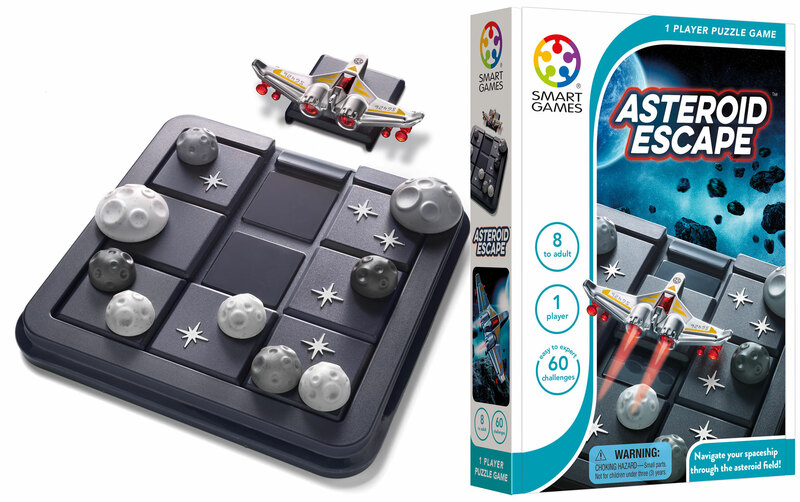 Asteroid Escape is a galactic sliding puzzle with 60 missions, from beginner to expert. Game includes 7 tiles with meteors, 1 with spacecraft and a game board with lid to easily store all pieces. Includes a compact travel case and 60 challenges. To find a specialty store near you, click on the Find A Store button on SmartGamesUSA.com home page.